Is Dance Trance (DT) a Fitness or Dance program? DT is a fitness program first where we use music video style choreography to help get us to the next level of fitness. We try to interpret what the artist is conveying to us in our choreography. We are pretty radical with our approach. We take dance and turn it upside down- we take fitness and turn it upside down, then MASH the two together to give us this very edgy street fitness program. DT is a choreographed dance fitness program that includes dance combinations and cardio moves to get you the most satisfaction possible from an intense workout. You can tone and shape, build your cardiovascular endurance, and loose weight all while picking up “off the chain” dance moves! We place a high importance on getting a workout when choreographing routines, this definitely sets us aside from other dance programs. We consider our dance style more street dance and do not follow traditional dance standards or techniques. For that reason, students do not need to have a dance background, just determination and commitment to progress inside the program package; whether Beginner, Intermediate or Advanced. DT can consist of one program or a variety of the programs offered below to give students more options depending on their ability level. Dance Trance, Dance Trance Break Down, P.A.C.E. Beginner’s program, DT Prep, DT Kidz and DT Platinum are all part of the Dance Trance experience. We will help you select what programs may be beneficial to your facility and geographic population to start out your program. Other programs may also be added at any date to boost your membership. P.A.C.E. stands for practice, attitude, confidence and enthusiasm. This program was developed from student requests that DT have a very slow “paced” entry program where they could gain confidence and learn dance moves before stepping into the faster paced class. This program is an optional adjunct to the regular DT classes. It is not required to fill up your classes, but it does add an extra component for students that you might loose due to lack of confidence and/or dance ability. This course consists of basic dance movement, nutrition, music instruction, flexibility training and confidence building. We recommend offering P.A.C.E. as a three month program and guarantees that you will progress into the regular classes if you attend all of the sessions offered. It is perfect for the student that thinks he or she “just can’t dance!” Space is usually limited and reservations are required for the program. The program fills up constantly prior to the start dates. This is a great class for those wanting to start out at a slower pace but unable to attend a three month PACE program. It is a class where you concentrate on one new routine every week and sign up for an eight week mini-course so that you come out with a great knowledge base of new material. We encourage all our DT locations to run a couple of PREP classes every week for new students. Break Down is another class that was born from student requests. Advance students wanted the opportunity to talk about routines and learn more intricate movements so they could continue to progress. P.A.C.E. students and beginners also asked for a class that was slower than Dance Trance so they could catch on at a slower rate & build up their cardiovascular endurance. 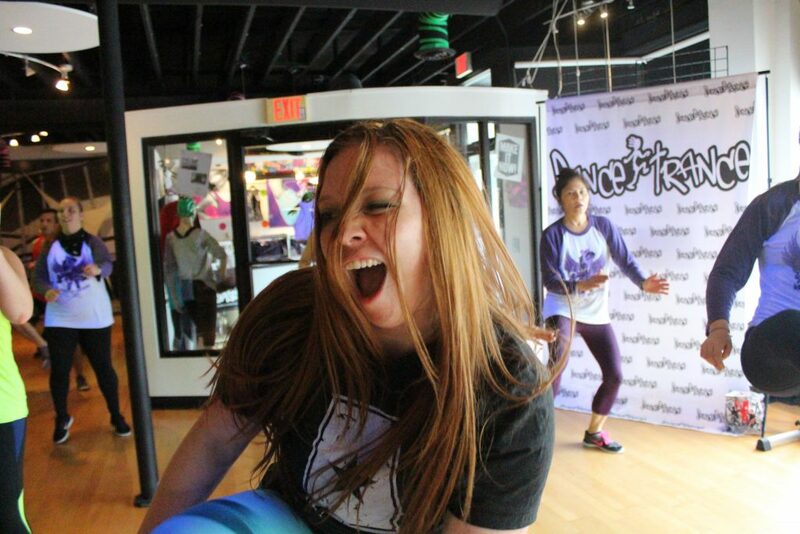 DTBD is a workout class where each routine is reviewed and “broken down.” Typically there are 4-5 songs introduced, reviewed and repeated per class. This is one of our most successful programs because all students want to participate, learn, and grow. Dance Trance is our advanced class for students. This is a high energy, great cardio workout that incorporates funk, house, rock, Latin, jazz, hip-hop, and other types of rhythmic movements to the beats of music from all genres. This your jam class and does not include any instruction on specific moves. You simply follow along with an instructor. Routines for this class are usually broken down in the intermediate or beginner’s class for students that do need instruction. Kids learn Dance Trance’s hip hop, funk, and music video choreography. Special songs are selected to current kids movies, etc. Add-on combinations and stretch start this unique experience, followed by instruction and specific DT KIDS routines. New routines are introduced on a regular basis to keep kids entertained and attentive. This is like one giant dance party. Great for kids that love to dance and want to stay fit! Choreography for this program is a separate program purchase and is not the same as Dance Trance choreography. This class is specifically for seniors but can be great for anybody that doesn’t want to spin, drop or pop like we do in our Dance Trance class. This class is low impact and less technical but still fun choreography for all to enjoy! Choreography for this program is a separate program purchase and is not the same as Dance Trance choreography. All the classes listed above are available for you to teach at your facility. Contact us at info@dancetrancefitness.com for further information.